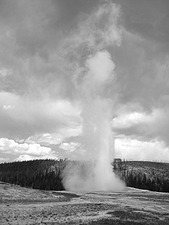 Vantage Travel’s 16-day adventuresome tour of Yellowstone, the Tetons, Arches, Grand Canyon, Bryce and Zion National Parks delivered exactly what was promised in its brochures and on its website: great accommodations, comfortable transportation and delicious meals, as well as incomparable scenery, and then some. Each of the parks is its own individual geological and botanical miracle. Each has its own particular attractiveness and special aura. Each is a phenomenal creation in itself. All are individually honed, scenic offspring of the earth. In late June, our tour began in first meeting our congenial tour director, Vickie Deschaine, at Bozeman’s Gallatin Airport, a warmish, state-of-the-art facility, designed with natural wood and stone art works, depicting the “old west “ character and nature of southwestern Montana. Our brief stay and breakfast at the Hilton Garden Inn set the high standard of comfortable lodging and tasty morning meals the rest of the trip would follow. Next, we boarded our luxurious, 40-passenger motor coach, complete with restroom and a cold-water urn, our new chariot. The drive to Yellowstone took us through Bozeman, with Vicki initiating her continuing pattern of explaining the economy, history, and unique features of each itinerary visit. We moved higher and higher in elevation, stopping on occasion for a special view or bit of exercise. In short order, we befriended each of our 35 companions on a one or two person basis when we dined, sat near one another on the bus, or conducted our wanderings around the Yellowstone area. Yellowstone National Park - where geysers spout, mud pots bubble, hot springs simmer, waterfalls thunder, and rivers rapidly surge through canyons of yellow, red, brown and white stone – is a place where the ground beneath you appears actively alive, hot and water shallow, almost ready to burst. The oldest national park in the world, it is an ecosystem of forests, marshes, animals, steam and thermal springs. We visited Mammoth Hot Springs, the Park’s headquarters, a former Army military base responsible for the design of the billed hats sitting proudly atop National Forest Ranger heads to this day. We learned about active pressures under the earth, volcanoes, geysers, and bubbling pools. Journeying to Old Faithful Snow Lodge, where we spent two days, we watched Old Faithful spew, then drove on and visually inhaled the awesome waterfalls, gurgling ponds, steaming caves, canyons and forestry with occasional glimpses of buffalo and other wildlife. Over the miles of approach, Vicki always identified the best photographic vistas of each park or venue of which we all took advantage, preparing us for the highlights and reviewing of them afterwards. By this time, we found our traveling companions easy to please, well informed, friendly, cooperative, and always back on the bus early after each meal, information center visit, or short bus stop. Vicki would say, “We have a half hour here.” Twenty minutes later, everyone was already back on the bus. From Jackson, we had a daylong trip to Salt Lake City, bused by the major downtown sights, and walked the grounds and buildings of Temple Square before settling in the Radisson Hotel for two nights. The following morning, we attended an organ concert and savored a video of the famous Mormon Tabernacle Choir that was on its own tour elsewhere in the U.S. We had an expertly delivered lesson in family tree research, aided by computers available to each of us. Several stayed on to trace their ancestors back a few more decades, while the rest of us were taken to Park City for a guided tour of the Olympic Park, site of the 2002 winter Olympic Games. 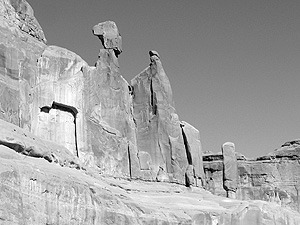 Next, in motoring to the Canyonlands Inn in Moab, Utah, came oddly molded mountains, strange-looking rock formations, some with stones atop seemingly hanging in thin air, and low flat mesas that dominated the flat ground spreading out for miles. At Green River, we learned about legendary one-armed founder of the Grand Canyon, John Wesley Powell. The following morning, we were introduced to Arches National Park, witnessing colorful spires, fins, strange unnatural formations of rock, and, naturally, plenty of arches. Originally formed by water, rushing, freezing, putting pressure on the sandstone until chunks fell out to produce openings, the park is a phenomenon of environmental wear and tear. That evening we stayed in a Hampton Inn in Kayenta, operated entirely by Navajos, with a fine restaurant and gift shop offering a rich assortment of Native American arts and crafts, and enjoyed a chance to catch up with our email and Internet searching. At the Grand Canyon, we had our first glimpse of the enormous scope of the huge chasm, followed by aerial views provided by the IMAX film, Hidden Secrets of the Grand Canyon. 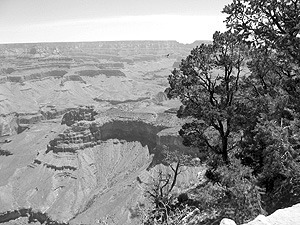 After settling into the Maswik Lodge, surrounded by forest, in South Rim Village, we sauntered along trails, peeked down into the Canyon from various vistas, took the convenient and frequent public buses that roamed the rim, and thoroughly enjoyed the leisure time we valued. Day ten consisted of an actual plane flight for some, for others, talks and events led by Park Rangers and more sauntering, peeking and appreciation of the Park’s many natural attributes. Heading for Bryce National Park, we stopped at the Visitor’s Center at Glen Canyon and were treated to a film, exhibits, and the impressive waterworks and dam. After a pleasurable lunch at a lakeside resort on Lake Powell, we remounted our bus heading for our next destination. Arriving in Bryce, we witnessed still another variety of mountainous scenery, colorful rocks molded into all kinds of fantastic shapes, plateaus and tablelands, some resembling amphitheatres forged into the hillsides, and others more spire-like, referred to as “hoodoos.” Spending two nights at Bryce enabled us to tour Rainbow Point, Natural Bridge and two extraordinary visitors’ centers providing the history and major features of the park. On the way to our final park destination, Zion, a new experience for all of us was a one-mile tunnel ride through the mountains with occasional glimpses through large glassless windows in the rocks at this enormous and spectacular gorge of sandstone, shale, and limestone. The Zion Lodge nestled within the park’s cliffs, canyons, and plant and animal life, provided a meaningful reminder of the consistently rustic nature of national park dwellings. Brice CanyonAs to humorous occasions, she recalled they included Peter Denison getting onto the wrong tour bus and her realization, after we were a mile away, that we’d left the Rittmans at one of the steaming Yellowstone pools. Our final two nights were spent in the similar fashion of all tourists to Las Vegas, browsing in magnificent hotel lobbies, window shopping in temperate indoor malls, pulling a few slot machine levers, picking up cards from a croupier, and trying to avoid the 115 degree outside temperature. Vegas was a far cry from our precious natural parks. Our “going away” dinner, included an Elvis Presley imitator, and the conversation and conviviality of former strangers having jelled as new friends promising exchanges of pictures, home visits and future trip plans together. How did others feel about the trip?